Laptops or notebook and netbook now no longer are a symbol of luxury. A person, who is driven to and fro, would prefer a laptop as a 'true friend' who will accompany each of their work wherever they go. But when it only when they want to buy a laptop, sure many of consternation for fear of wrong-buying or specifications do not power or anything else that might not be as the laptop is not a cheap item. In this modern era, you will quickly just begin a wide range of laptops with different specifications and brand name and price. Computer companies and software manufacturers are racing to introduce new models only a few months interval. Perhaps there are many users who buy a laptop with the most advanced specifications without considering its use. Uses a laptop just to check email and read the newspapers online, but specification laptop up 3GHz processor, 1GB RAM, 120 GB or bigger capacity hard drive. Determine about how you will use your laptop because the laptop will be used for office use, regular use at home (Email, News, and Microsoft Office), design, gaming, blogging, and development of the system, download movies and mp3, mobile or all specified. Desktop Replacement: Intended for the gamers, graphic designers, or other pekerjaan2 that require performance above rata2. Laptop type usually large, heavy, and has a screen measuring over 15 inches. Characteristic of this type of laptop is there a separate VGA card, not integrated. Is to support the graphics capabilities that are needed by the laptop of this type. Processors used only top-class processor like Intel Core 2 Duo or core i3 up core i7, thus making its prices become very expensive. If the laptop is only used for normal use at home such as email, reading news, browsing the Internet, typing letters, etc., processor speed, capacity RAM (Random Access Memory), hard drive and Graphic Card (VGA Card - Video Graphics Array) need not be high. Simple specification is more than adequate. If you buy a laptop with a simple specification can save you money. If your laptop is used for the purpose of design and gaming, we suggest you choose the specifications of the laptop, with emphasis on the VGA card and high memory. If you want a laptop with a higher capacity, choose a multi-core technology and 64-bit processor is recommended. 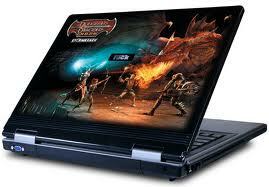 Laptop with VGA, high strength and large memory will make the design and game play you feel more 'light'. VGA card itself is useful to interpret the computer output to the monitor. While the memory (RAM) is a digital data storage devices while normally a size standard based on the capacity of digital bits, such as 16MB, 32MB, 64MB, 128MB, 256MB, 520MB, 1064MB and so on. Developing for the system, you can choose to consider a laptop with a processor and memory to be able to offset the high specification development tools developing. Multi-core technology and 64-bit processor architecture is also recommended. For anyone moving anywhere, you can emphasize on the choice of battery life, weight laptop, screen size and some internal connectivity features such as Wifi, Bluetooth, IrDA, Network Card, modem, etc..
After you specify the use of a laptop for yourself, other things to consider before buying a laptop is the screen size, weight and battery life laptop. If you often take your laptop anywhere, we recommend you select a lightweight laptop, with screen size not too large so as not difficult to take. The battery life is also important. Some laptop batteries cannot hold two to three hours without connecting to the socket. Make sure your battery if you are a 'mobile'. If you want to save battery, turn off the Wi-Fi or Bluetooth connectivity such as the function will be a lot of energy from the battery. When buying a laptop, do not forget to consider the service provided by companies such as laptop manufacturer’s warranty, international warranty, etc. There are manufacturers that provide home services and repair services. They also have to provide 'home collection' and 'home delivery' when we want to make a warranty claim.